Fenugreek leaves recipe collection. Methi, also known as fenugreek leaves, is a green, leafy plant that has been used for centuries for its spice and medicinal uses. The leaves are also widely used to make different types of foods, especially in south Asian Countries like India and Pakistan. Some of the varieties of foods that can be made with methi are subzis, rotis/parathas, patties/tikkis and many more. Apart from the leaves, methi seeds are used a spice and flavoring and kasuri methi (dried fenugreek leaves) are used to give a very unique taste. Methi is also very high in nutritive value and hence there is an abundance of methi recipes to be found. 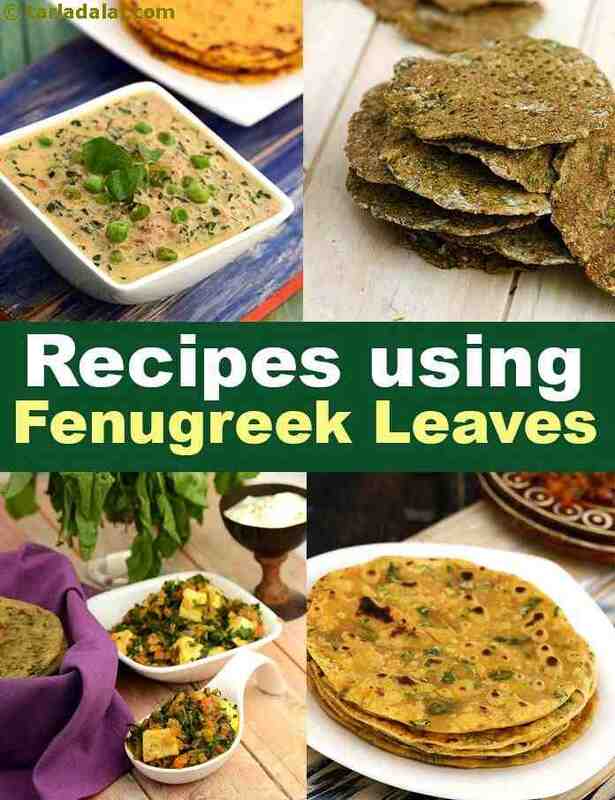 Below is a fabulous collection of Fenugreek leaves recipes that you will definitely love. The first name that comes to mind when you think about methi in Indian subzis is Methi Matar Malai. It is the most famous methi subzi in India because of its rich and creamy texture and delectable taste. Another really popular dish, made on an everyday basis, is Aloo methi. This dry subzi is flavored with cumin seeds, ginger and garlic with crispy yet soft potatoes that complement the methi very well. Add cauliflower to this subzi and you get Aloo gobi methi tuk. A very unique combination of corn with methi, curd and palak makes for a very nutritious Palak methi and corn subzi that will be loved by all. Palak and methi together is a winner combination so to add methi in in palak subzis gives it a very nice, earthy twist like in Methi palak paneer subzi. Gujaratis love their methi and it is evident in Methi Papad Subzi, one of the staples. We often snack without regards to how healthy the item is, especially in India with all the kachoris and puris! And for a healthy, leafy green like methi, its best had in a healthy way. If you are craving something fried, look for a baked option instead like this Baked Palak Methi Puri made with jowar and bajra flour or the classic Gujarati Baked Methi Muthias. Adding methi to a dough made of whole wheat flour and oats, increases its nutrition and makes a delicious Methi Oats Roti! With whole wheat flour and fenugreek leaves, you can also make Whole Wheat Methi Khakhras that all rich in vitamins from the methi. Apart from snacks, dals like Toovar and Methi dal and simple, yet wholesome vegetables like Methi Moong Dal Subzi can also be made healthy. In India, there are a variety of rotis and parathas to choose from. A few of them include methi in them, with different combinations, making them unique and delicious. One such paratha is Methi Paneer Paratha, with a stuffing of methi, paneer and tastemakers like cumin. The same way Aloo Methi Paratha can also be made. Gujaratis regularly use this aromatic green in Methi Thepla and serve it with dahi or raita. Being a traditional favorite, everyone loves kadhi. Methi Pakoda kadhi, a variation of the classic, adds a unique flavor to the dish. If looking for something heavier to accompany a roti or paratha, Methi pitla perfectly serves the purpose. Another tongue tickling subzi is that of methi and peanuts called Methi chi patal bhaji, which is flavored with garlic and coconut. There is a plethora of snacks that can be made with methi. Adding methi to any snack makes it much better in terms of taste and color. Palak Methi Dhokla has a vibrant green color due to the methi and it tastes very unique! As we already know that spinach and fenugreek leaves go great together and hence using that combination to make Palak Methi Muthias is an excellent idea. Fenugreek leaves can even be added to besan to make flavorful Methi Pakodas, a famous street side snack or to compliment the sweetness of corns in Methi Makai Dhebra. Enjoy our methi leaves recipe collection below.